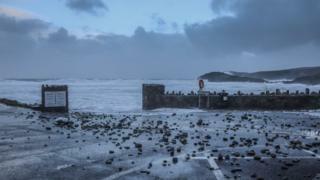 Wales suffered power cuts and widespread disruption on roads and public transport as Storm Brian battered the UK. 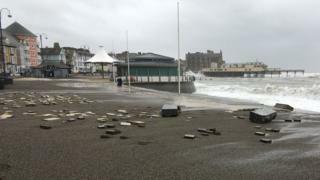 The strongest gusts on the UK mainland were in Wales, with 78mph (125 km/h) winds recorded at Aberdaron, Gwynedd, and Capel Curig, Conwy county. 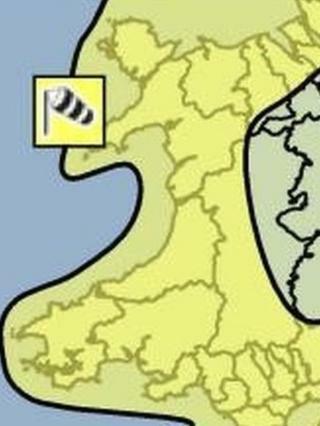 Dozens of trains had been cancelled and ferries were affected as a yellow "be aware" Met Office warning is in place. 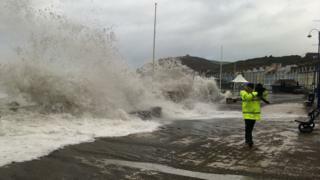 A flood warning is still in place in Conwy county on the River Conwy. Newport and Caerphilly were worst areas affected by power loss but most properties have since had their electricity restored. The M4's Briton Ferry Bridge - between junction 41 and junction 42 - in Neath Port Talbot and the M48 Severn Bridge in Monmouthshire were closed due to high winds, but reopened late on Saturday evening. The A477 Cleddau Bridge in Pembrokeshire has also reopened while the A55 Britannia Bridge between Anglesey and the mainland was closed to high-sided vehicles. Dozens of Arriva Trains Wales services were cancelled around Wales and there are widespread delays on the network as temporary speed restrictions are in place on the majority of railway routes. A train struck a tree near Cross Keys, Caerphilly county, but no injuries were reported. The line between Ebbw Vale and Cardiff has now reopened after tree became jammed underneath the train. 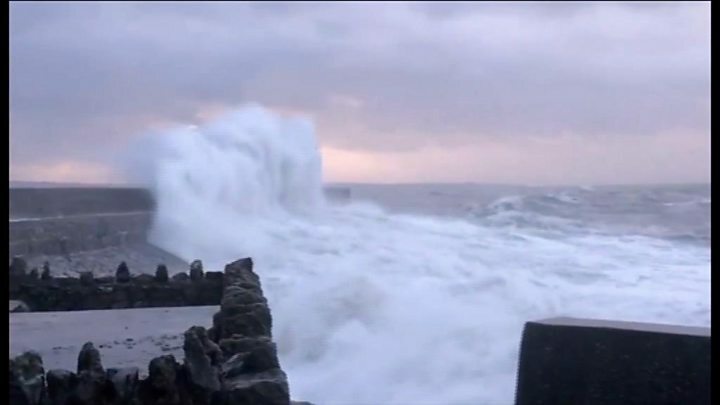 Stena Line cancelled the 13:10 BST service between Fishguard and Rosslare. 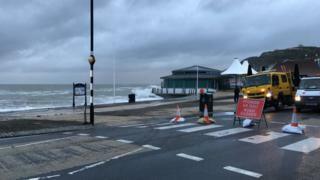 Roads off Aberystwyth's seafront - Marine Terrace, Victoria Terrace and New Promenade - and at nearby Aberaeron are shut due to the high tide. 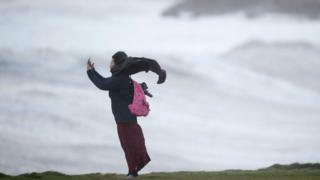 The weather warning for wind started at 04:00 BST on Saturday and lasts until midnight. 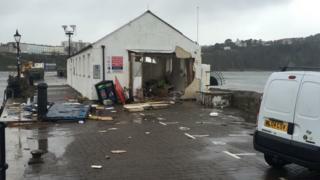 A number of coastal roads were shut in Pembrokeshire but have since reopened. 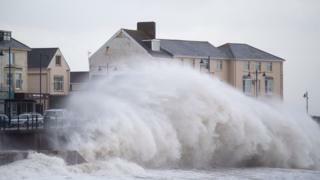 Natural Resources Wales (NRW) said the coastline was likely to be "extremely dangerous this weekend" and has urged people to avoid it. 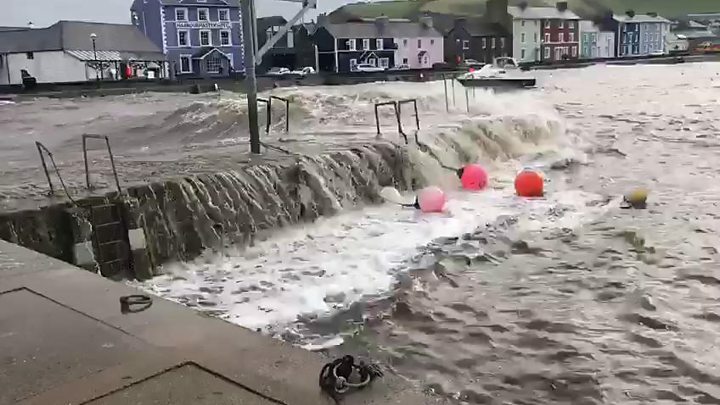 It has issued a number of flood warnings and flood alerts around the coast, from the Wye Estuary in Monmouthshire to Anglesey. But flooding is now expected around Trefriw, in Conwy county, with immediate action recommended by NRW. 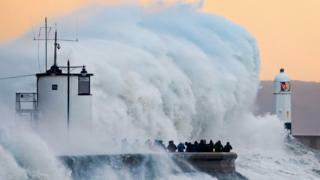 Tenby RNLI said it had launched its lifeboat to help a person in difficulty at Skrinkle, while Porthcawl RNLI warned people to watch the storm waves on its live feed, after people were spotted taking photographs from the harbour wall. 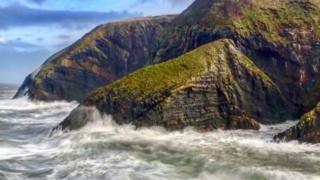 How is Storm Brian affecting you? Have you got any pictures from your area?